Video 1 (2:19). Harald Bode talking about building modular synthesizers and using them in conjunction with other electronic instruments. On the 4th of July weekend in 1972, Ralf Bode and his wife Lenore 1[1. Lenore Bode had been the director of photography for 1971 the Kate Millett film Three Lives and a member of the Women’s Liberation Cinema. Ralf Bode’s later credits would include Saturday Night Fever and Coal Miner’s Daughter (as director of photography in both). As well, son Peer Bode, and in some instances Harald, ran the camera. Irmgard Bode and Ralf’s young son Paul were also in attendance.] shot footage for a planned documentary on his father, Harald Bode. In addition to an Arriflex 16 mm motion picture camera, a new Sony Porta-pack borrowed from the student video organization at the University of Buffalo (an offshoot of the Media Study program, directed by Dr. Gerald O’Grady) was used in shooting. At the time Harald was 62 years old and it would be two years before he would retire from Bell Aerospace, where he was developing microcircuits while working on instrument designs and music compositions in the evenings. Video 2 (4:39). Harald Bode performing on his instruments in his studio. 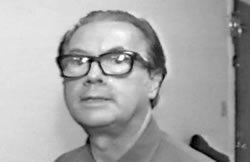 1972 was the same year Harald started the Bode Sound Company and is five years before the Bode Vocoder, nine years before the Barberpole Phaser and still thirteen years before Harald would be programming and developing hardware for his Commodore 64 home computer. Video 3 (2:37). Harald Bode plays and talks about the development of his organs in relation to the changing market needs and desires. The video was shot on half-inch reel-to-reel videotape; this was Ralf Bode’s first experience with the new video cameras. He was even then an accomplished cinematographer. Ralf’s relaxed fluidity and intuition concerning composition for the video format makes this footage a remarkable document of early work in portable video. These four clips have been culled from close to four hours of footage shot over the course of the holiday weekend. In the first clip, Harald briefly describes the instruments in his studio before programming a patch for an original composition he will later perform on the tape. Video 4 (3:57). Harald Bode talking about the complexity of the artistic personality… and signing out from the Hexenküche [witch kitchen]. 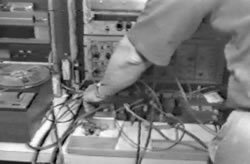 On the video tape in the second clip, Harald does not identify the patch he is using, but it likely includes the prototype 750B Frequency Shifter with the industrial oscillator as carrier input. 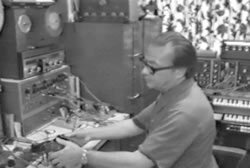 Also heard are the 1960 Audio System Synthesizer with tape reverb and the later model Bode Synthesizer, which were among his custom studio instruments at that time. 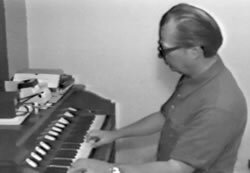 Harald plays a 1956 Estey prototype organ of his own design in the third clip; the organ never went into production. It differs from the production organs in that it has programmed voices, not the pipe stops of the Estey model S and AS-1. Harald briefly describes the period between the innovations of the 1947 Melochord and 1960 Audio System Synthesizer. During this period Harald designed instruments for AWB in Germany and Estey Organ in the US. Finally, Harald begins from an earlier question from Ralf concerning the great obstacles in his life and what he would have changed. Harald’s initial response, which is not included in the clip, is that he would have canceled both world wars, and specifically, that had it not been for the Second World War, the course of his life would have been very much different.